It's recommended to use the new iRedMail Easy deployment and support platform to deploy and keep your mail server up to date, technical support is available through the ticket system. iRedMail is designed to be deployed on a FRESH server system, which means your server does NOT have mail related components installed, e.g. MySQL, OpenLDAP, Postfix, Dovecot, Amavisd, etc. iRedMail will install and configure them for you automatically. Otherwise it may override your existing files/configurations althought it will backup files before modifying, and it may not be working as expected. Amazon AWS EC2 blocks port 25 by default, if you plan to deploy mail server with AWS, you need to remove the throttle on port 25. A FRESH, working OpenBSD system. Supported releases are listed on Download page. 2 GB of memory is recommended for a low traffic production server. Spam/Virus scanning will take most system resource. Make sure 3 UID/GID are not used by other user/group: 2000, 2001, 2002. All binary packages will be installed with command pkg_add -i.
Nginx is used as web server. PF is enabled by default, with basic rules for ssh and mail services. OpenSMTPd are disabled by default, replaced by Postfix. No matter your server is a testing machine or production server, it's strongly recommended to set a fully qualified domain name (FQDN) hostname. On OpenBSD, hostname is set in two files: /etc/myname and /etc/hosts. /etc/hosts: static table lookup for hostnames. Warning: Please list the FQDN hostname as first item. Verify the FQDN hostname. If it wasn't changed after updating above two files, please reboot server to make it work. iRedMail will install all required binary packages with command pkg_add -i from mirror site defined in file /etc/installurl (FYI: installurl(5)), If no mirror defined, iRedMail will use the fastly CDN for package installation. It's recommended to install packages from a mirror site, to reduce server load on OpenBSD primary servers. Also, installing package from a nearest mirror site will speed up package installation. You can find mirror list near you on OpenBSD web site: Getting OpenBSD. 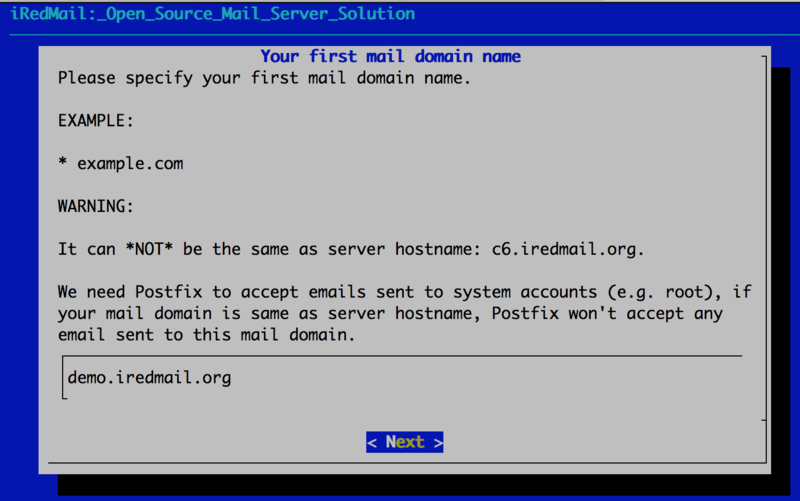 iRedMail is wrote in Bash shell scripting language, so bash shell interpreter is required. And bzip2 is used to uncompress downloaded iRedMail package. Visit Download page to get the latest stable release of iRedMail. 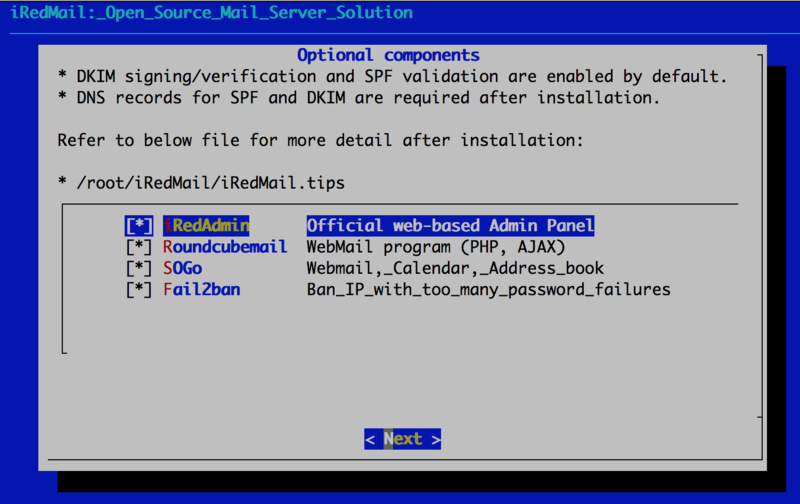 It's now ready to start iRedMail installer, it will ask you several simple questions, that's all required to setup a full-featured mail server. Specify location to store all mailboxes. Default is /var/vmail/. Choose backend used to store mail accounts. You can manage mail accounts with iRedAdmin, our web-based iRedMail admin panel. There's no big difference between available backends, so it's strongly recommended to choose the one you're familiar with for easier management and maintenance after installation. 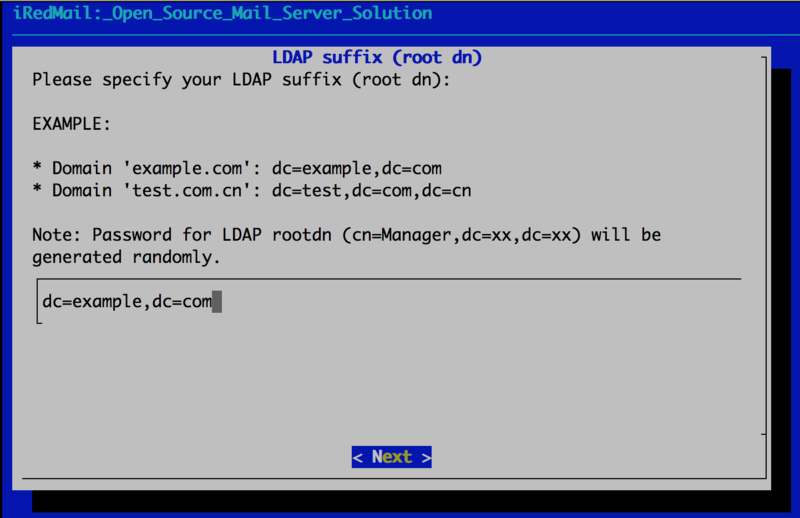 If you choose to store mail accounts in OpenLDAP, iRedMail installer will ask to set the LDAP suffix. 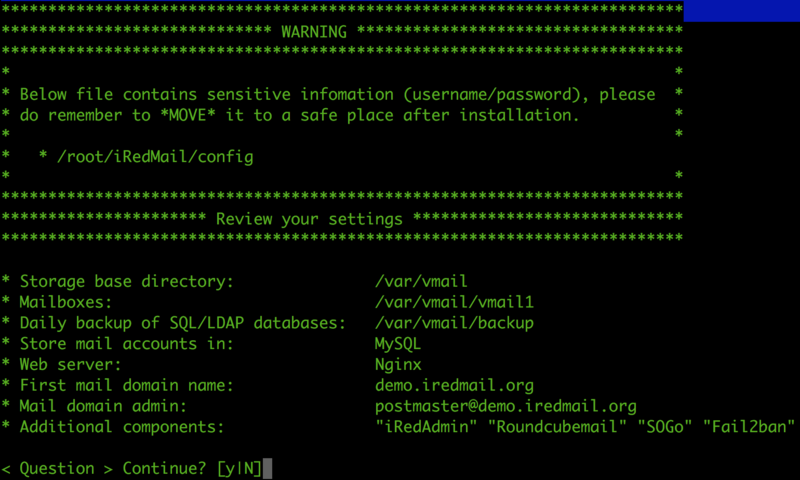 If you choose to store mail accounts in MySQL/MariaDB/PostgreSQL, iRedMail installer will generate a random, strong password for you. You can find it in file iRedMail.tips. Set password of admin account of your first mail domain. 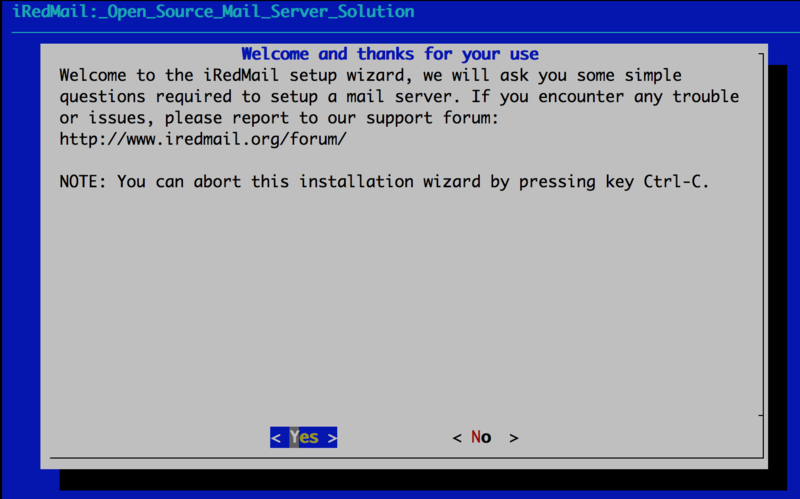 After answered above questions, iRedMail installer will ask you to review and confirm to start installation. It will install and configure required packages automatically. Type y or Y and press Enter to start. 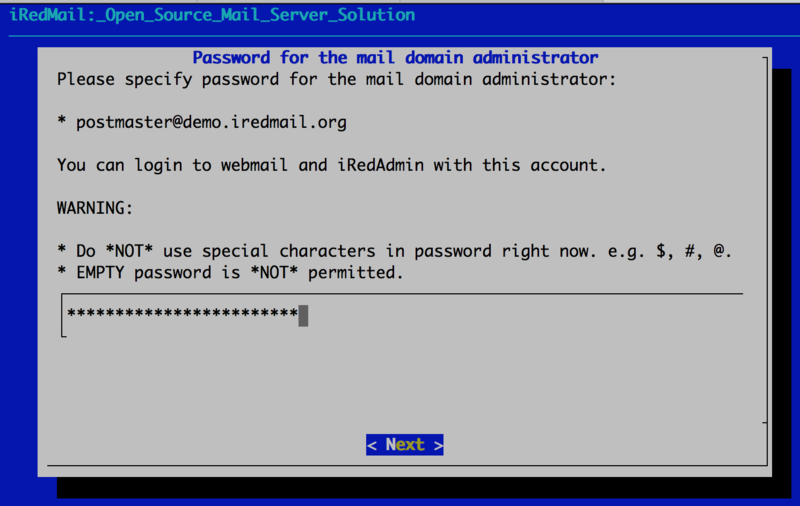 The weakest part of a mail server is user's weak password. Spammers don't want to hack your server, they just want to send spam from your server. Please ALWAYS ALWAYS ALWAYS force users to use a strong password. Location of mail service related software configuration files. You can also check this tutorial instead: Locations of configuration and log files of major components. It's highly recommended to get a SSL cert to avoid annonying warning message in web browser or mail clients when accessing mailbox via HTTPS/IMAPS/POP3/SMTPS. Let's Encrypt offers FREE SSL certificate. We have a document for you to use a SSL certificate. 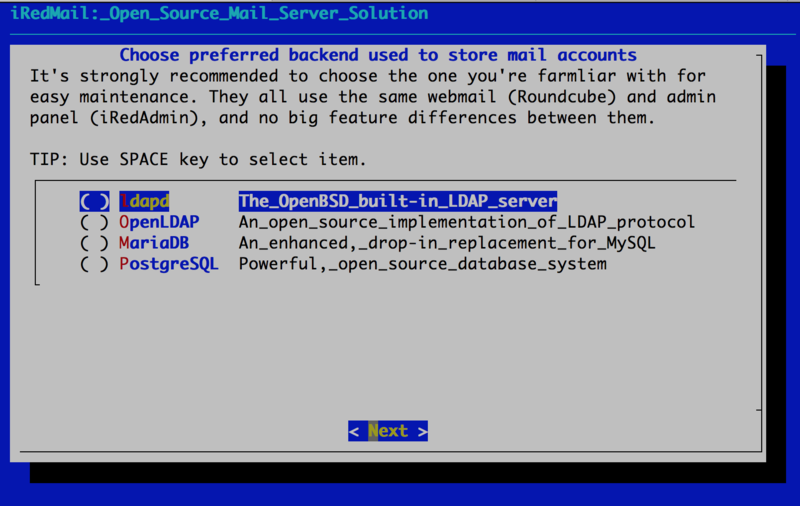 If you need to bulk create mail users, check our document for OpenLDAP and MySQL/MariaDB/PostgreSQL. 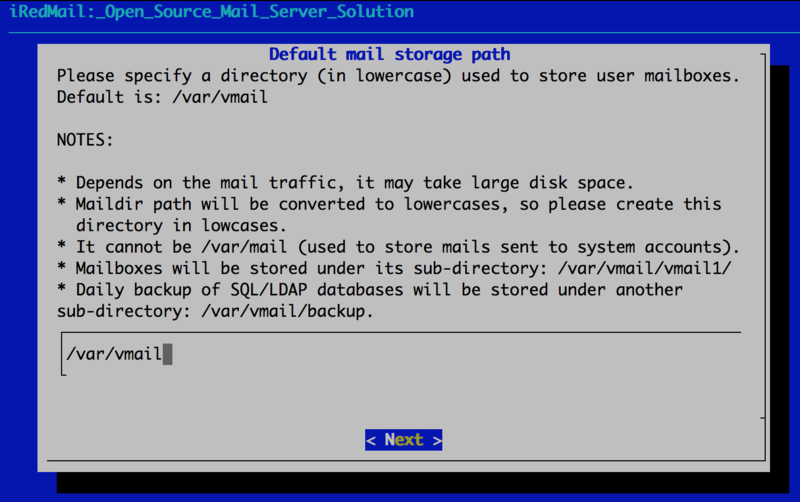 If you're running a busy mail server, we have some suggestions for better performance. After installation successfully completed, you can access web-based programs if you choose to install them. Replace your_server below by your real server hostname or IP address. You are welcome to post issues, feedbacks, feature requests, suggestions in our online support forum, it's more responsive than you expected. We offer paid professional support service too, check our web site for more details: Get Professional Support from iRedMail Team.